NASA astronaut Anne McClain is pictured exercising aboard the International Space Station inside the U.S. Destiny laboratory module. The Expedition 58 astronauts explored time perception and tested a wearable body monitor aboard the International Space Station today. The orbital residents also packed a U.S. space freighter and set up tiny satellites controlled by students on Earth. Astronauts Anne McClain and David Saint-Jacques started Monday in the Columbus lab module learning how microgravity affects time perception. During the experiment the crew judges time length with results compared to ground tests. Scientists hypothesize that astronauts experience time passing at a faster rate than those of us here on Earth. McClain then spent the rest of the day with Commander Oleg Kononenko setting up and monitoring SPHERES satellites in the Kibo lab module. High school students compete to design the best algorithms that control the basketball-sized satellites to mimic spacecraft maneuvers and formation flying. 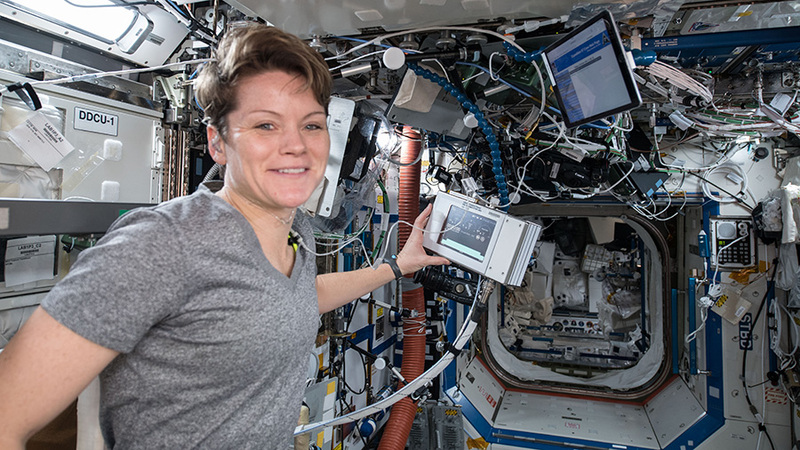 Saint-Jacques set up a wearable device called the Bio-Monitor to test its ability to measure vital signs with minimum interference during a normal day in space. The Canadian astronaut also continued packing the Cygnus cargo craft from Northrop Grumman ahead of its Feb. 8 departure from the Unity module. I too thought so that when we travel faster in space , the time gets going slower .